IP Control. The addition of IP control (aswell as RS232) for fast, reliable and easy integration with control systems. Ready-made IP drivers are already available and bundled free for Control4, Crestron, AMX, RTI, DemoPad and more. Forwards IR In addition to backwards discrete IR, a forwards IR channel has been added, giving integrators the ability to send IR commands from a centrally located control system to the TV location. Enabling IR control of the TV set or any other IR devices located in that vicinity. Power over Ethernet (PoE) Eliminates the need for the Receiver’s own ‘wall-wart’ power supply making for a simpler, easier installation. UK Wallplate Receiver Design A new UK wallplate design with PoE has been added to the range as an alternative Receiver option. Fitting neatly into a standard doublegang UK back box, it removes the need to hide the Receiver somewhere. 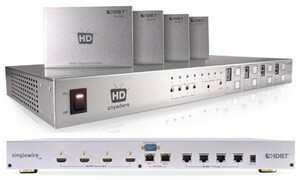 4×2 HDBaseT Mini System A new ’2TV’ system has been added to the HDanywhere HDBaseT product lineup. Perfect for smaller projects, such as apartments or hotel suites, it’s low dealer cost opens up greater margin potential for fast turnaround, smaller installs. The HKHA414SW (£1,500 or about $23,00) is a four source, four output HD HDMI Matrix distribution package. Enabling the simple connection of up to four HD sources (Sky + HD/BluRay/PS3 etc.). Users are finally able to realise the full potential of “whole house” HD distribution and source IR control + high speed internet access at every TV location in an all-in-one package. Developed as a professional multiroom system using the latest HDBaseT technology, the HDanywhere Multiroom+ System converts the HDMI signal so that it can be transmitted along either Cat5e or Cat6 cable up to 100m, without losing any definition. At the HDTV, a Receiver (RX) converts the Cat5e/6 cable back to HDMI for connection to the TV. The HDMI transmission remains totally uncompressed, so pixel-for-pixel, it is exactly the same as using a direct HDMI cable – there is zero loss of quality. A fantastic new feature of HDanywhere systems comes in response to the popular emergence of on-demand Internet services (such as BBC iPlayer, online gaming, social networking and Smart TVs). Each HDanywhere Receiver now has 2 x 100BT Ethernet ports available for devices requiring a high speed connection to the Internet. The result is uncompressed HD video & audio with full remote control over the source being watched and fast internet access at every display location. HDanywhere’s adoption of HDBaseT technology allows all this functionality over a SingleWire making it the perfect choice for retrofitting onto existing home network cabling. DIY installation is easy with just one Cat5e/6/7 cable needed per TV location. Through the RX full IR remote control of the HDMI source (such as pause, rewind etc) is possible as if you were sitting right in front of the box. An infrared magic eye connected to the RX receives the remote control signals and sends them back to the central hub, where a transmitter beams them out to the source. Each HDanywhere Multiroom+ Hub and the Display Receivers have integrated mounting brackets for easy, out-of-the-way installation.